I just love having company over! Yesterday Kara and today Claire Watkins, a professional interior decorator and blog author of High Gloss Blue is here to share a simple little no sew coverup for those of us with vintage wall mounted sinks. The floor is yours, Claire. Hi! My name is Claire and that was my sink. Visible hair taming tools, yucky pipes and tired tiles that if you squint really hard could hypothetically recall Bisazza. The After: A Little More Fab-U-Lous. 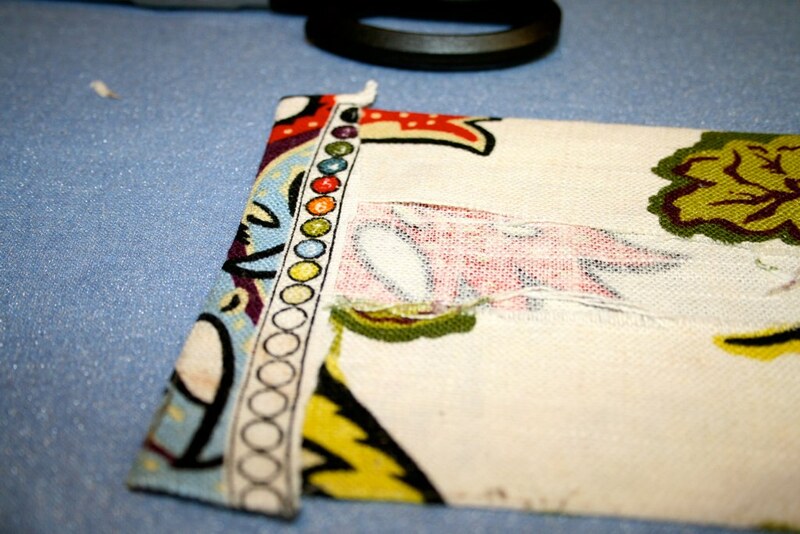 No sewing skills needed. Scratch that. No skills at all needed. So I'll take you through the super duper easy steps in case you have a yucky sink like mine and are relegated to the depths of inaction by the mere fact that you are a renter, Bleh (i.e. you can't replace your nasty sink, so you have to find a way to live with it)! I started with an IKEA panel (the ubiquitous VIVAN) that I had leftover from another project and cut out the amount I needed to wrap the sink. 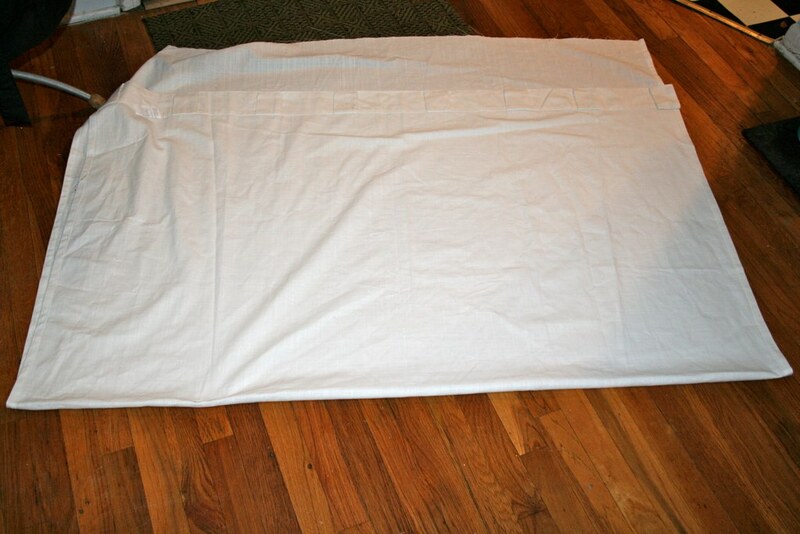 Usually, I like curtains and skirts to slightly touch the floor, but since the bathroom floor gets wet, I cut the fabric a tad bit shorter than floor length. 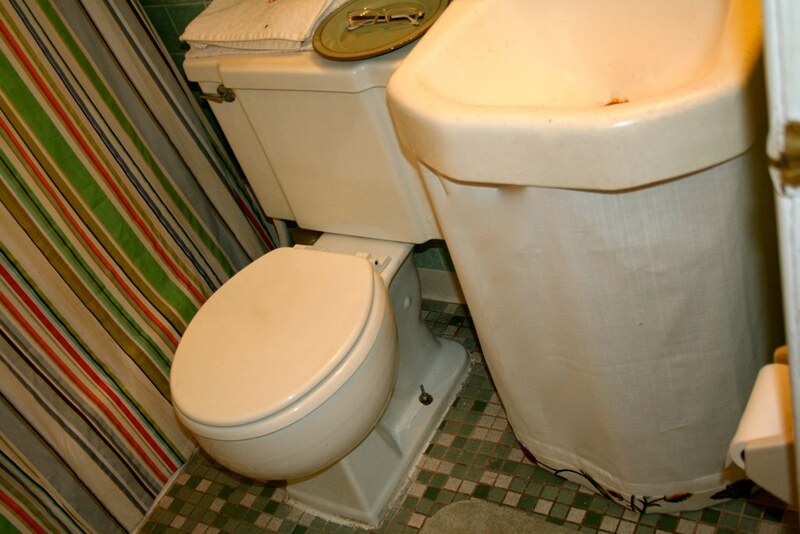 Don't worry about this too much because you will be able to move your skirt or down a little when you attach it to the underside of your sink. Using some fabric leftover from when I made my living room drapes, I created some trim to finish the edge of my sink skirt. Making sure the elements relate from room to room in my little apartment helps me give the overall space a sense of unity and will add just a little jazz. Using an iron and some Stitch Witchery, I made sure to create a clean hem by folding over all the sides and tacking them down. 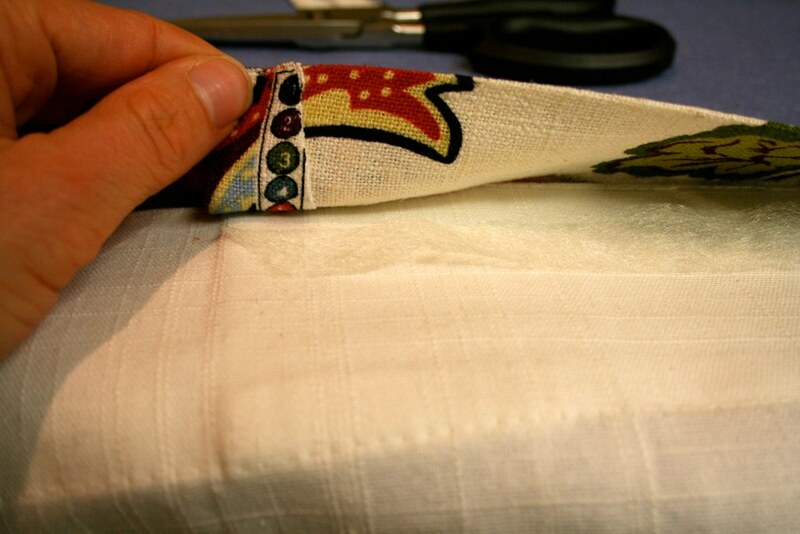 Next, I folded the trim piece in half, hot dog bun style around my white skirt (see the finished edge of the original panel also acts as the finished edge of the sink's skirt). Using more Stitch Witchery I adhered the trim to the skirt on both sides. Using heavy magnets, I stuck my skirt to the inside of my metal sink. Per the suggestion of Real Simple magazine, I tried using strong Velcro first, but the sink collects moisture and within a few minutes, the Velcro's adhesion failed. Magnets win! Big, big thanks to Mrs. Limestone for having me today and thank y'all so much for reading! Most days you can find me in Atlanta where I author a blog called, High Gloss Blue. I am an interior designer by education and a dilettante professional by definition (I opened my own company, Claire Watkins Interior Design, just this year). I love dogs, chocolate, good jeans, white marble, sunshine and Saarinen. I really like that fabric! I know Mrs. Limestone is currently traveling, so I just wanted to let her readers know that she did a "10 Things I Can't Live Without" post on La Dolce Vita today! magnets are such a great idea! cute fabric too. This is a great idea, especially for renters! great idea! Good work Claire! I love that fabric! The print is gorgeous. Can't really see the trim fabric at all on finished skirt. 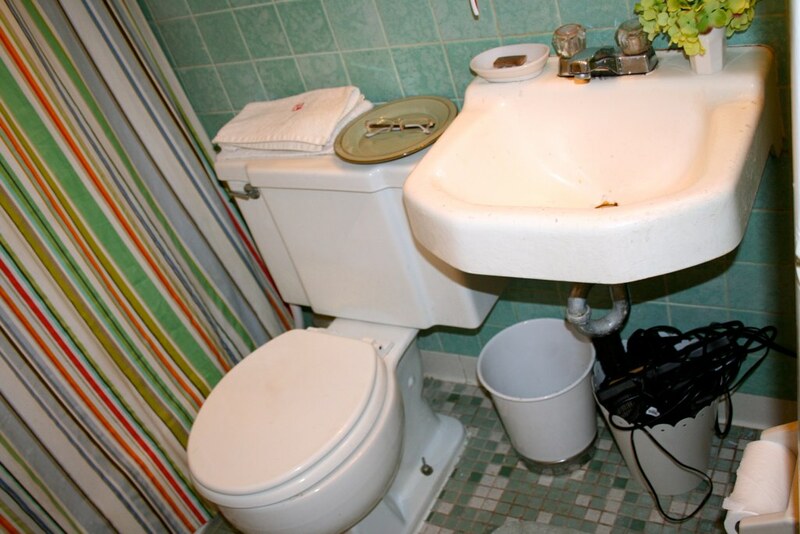 There are plastic or even vintage ceramic caps to cover that unsightly screw that holds the toilet in place. The screw looks tall; sometimes they need to be cut down for the cap to fit on. A mild bleach solution could clean the stained grout on the floor. They also now make a product especially for renewing the color of your grout and it has a sealer in it also, I believe. It also appears to be really grotty underneath the faucet. Darn these great cameras we have now. Wow, I didn't really mean for this comment to sound mean, but gosh, really, this room is not ready for it's close-up. Even if it was just supposed to be about the sink skirt and the decor isn't complete, well, we can always clean, at least. This post isn't of the quality to be on this site. Just my honest opinion; I'm sure everyone will hate me. If you thought everyone would hate you for your comments then why would you say them? I believe we're all entitled to our opinions but I learned when I was little if I had nothing nice to say then say nothing and to treat guest (which she is) with respect and be nice. Love the tip - the magnets idea is fab! sometimes being "nice" is so phoney. I love the idea about the magnets and the curtain, but I was really excited to see the floor since I'm currently working on a vintage bathroom project myself. 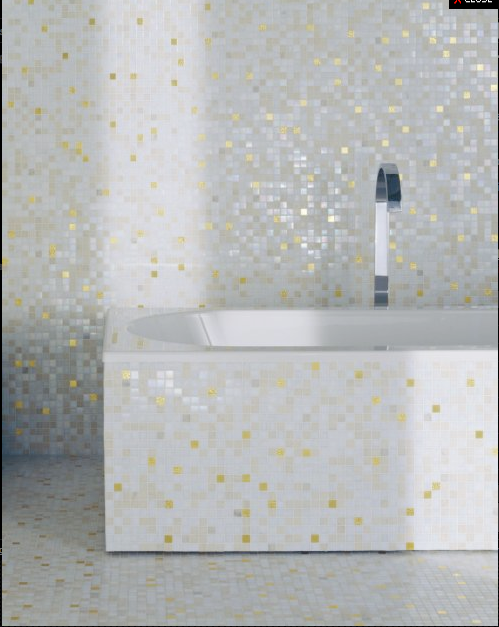 Believe me when I say that it is not easy to clean that old tile or grout; bleach and water will not do it! But I found the product that did it for me. I honestly could do a commercial about it. You can see for yourself at http://www.livinglifecreatively.com/2010/01/kaboom-just-one-more-time-promise.html. I understand what Laurie said about being nice, and I think I am by sharing what I found to work on vintage tile. I wish somebody had told me six years ago when I moved in here. LOL. You're exactly right, Denise- that tile (and grout especially) is a pain. The only luck I have had with the grout is letting bleach sit on it and then scrubbing it with a q tip, in small sections. I guess it is a little obvious that I have lost interest in this and I didn't really worry about it for a post on the skirt. Any way, I am happy for your tip. Maybe I'll have a before and after on my blog. Haha. 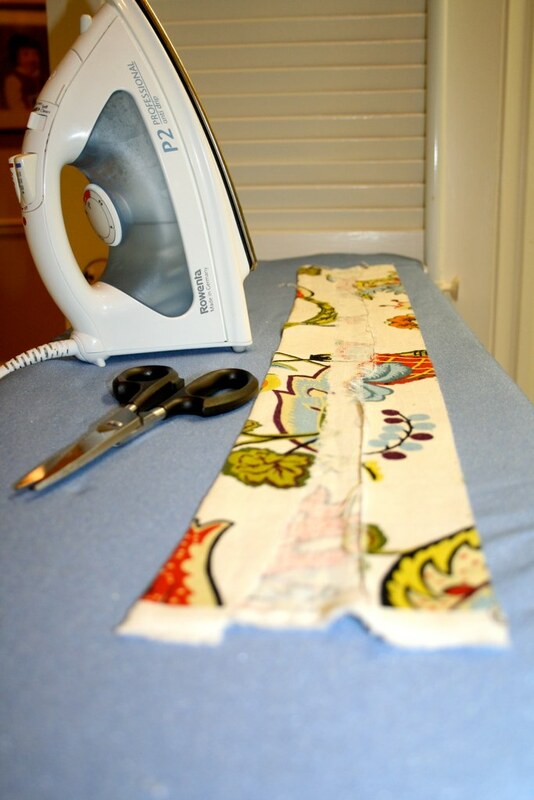 So glad that y'all like my magnet tip and the fabric is Wilmington in multi by Covington. 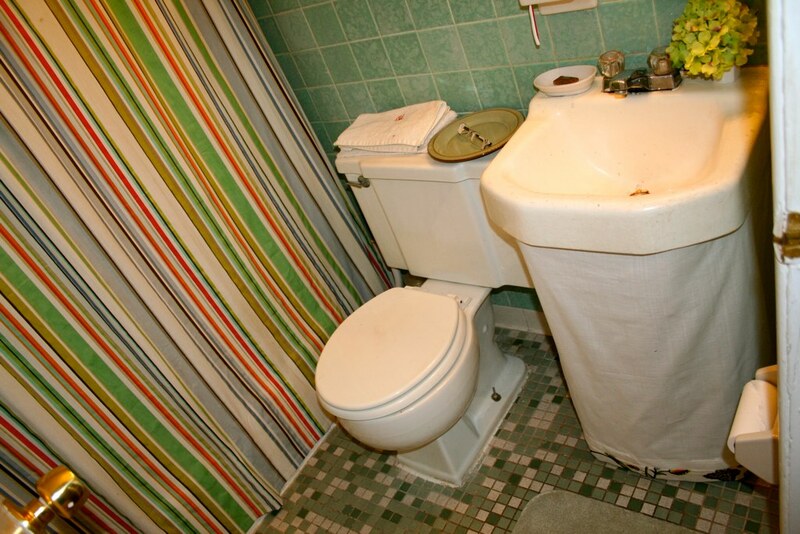 A "sink skirt"? Forgive me, but I just can't digest it. Great idea for the sink. Suzie Q...being nice if you don't mean what you say is phony, telling someone their project doesn't deserve to be showcased on this blog when the guest was invited doesn't sound like a helpful comment to me. Like I said before, everyone is entitled to their own opinion and if you look at Denise's comment, you'd see there's a way to give helpful suggestions without worrying that everyone on here will hate her like Shelia was worried about after speaking her mind. I don't always like things I run across on various blogs and so what do I do, I don't comment, I just don't feel the reason to point out the negative.